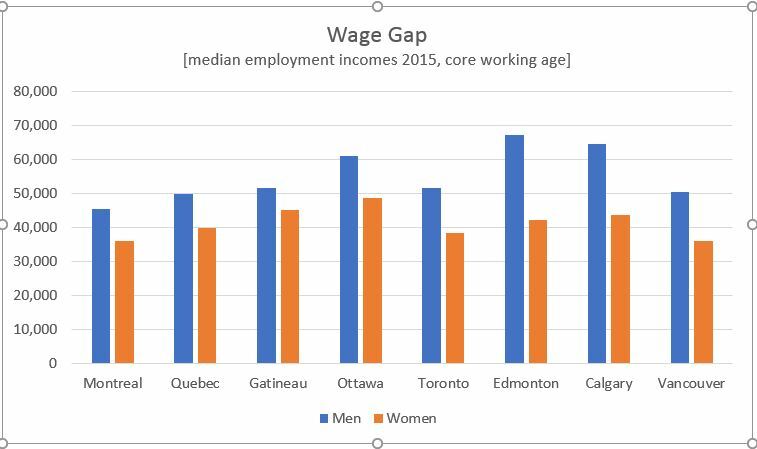 Edmonton and Calgary continue to have the largest gender wage gap, with women earning 63 cents on the male dollar in Edmonton and 68 cents on the dollar in Calgary. This is up slightly from ten years ago when the wage gap was 60% and 64% in the two cities respectively. Edmonton has tabled some new initiatives aimed at making women’s lives better, including the WAVE initiative and a recently tabled motion to increase access to childcare. Calgary…. I’m looking at you. In Toronto, the wage gap has actually gotten worse over the past decade. In 2005, women were earning 76% of what men earned; today they earn 74%. The recently proposed $15 minimum wage may go some way to reversing Ontario women’s fortunes, as the majority of minimum wage earners are women. But backwards is never a good sign. At the current rate of change, it would take Canadian women another 70 years to see their wages catch up to those of men. That means a girl born today would have most likely retired before she could count on her daughters and granddaughters being paid the same as her sons and grandsons. Poverty rates also look different depending on where you live and who you are. London and Windsor both saw the poverty rates increase over the past decade, with nearly one in five now living in poverty in those two cities. St. Johns saw the biggest decline in poverty rates for both men and women. However, their gender gap in poverty rates is also the largest among Canada’s 25 largest cities, with 17.3% of women compared to 14.5% of men living in poverty. The federal government is starting to unroll its poverty strategy, but we’ll have to wait for the next Census to see what impact it has. In the meantime, higher wages for low-income earners and pro-active pay equity policies might fill in the gap for women who aren’t feeling that big boost in their incomes. The way you guys calculated the wage gap is misleading, this makes me doubt anything your crunching number say. Are these numbers taking into account the type of jobs, the number of hours worked, how risky these jobs are? etc.